The book is a collection of contributions devoted to analytical, numerical and experimental techniques of dynamical systems, presented at the International Conference on Dynamical Systems: Theory and Applications, held in Lodz, Poland on December 2-5, 2013. The studies give deep insight into both the theory and applications of non-linear dynamical systems, emphasizing directions for future research. Topics covered include: constrained motion of mechanical systems and tracking control; diversities in the inverse dynamics; singularly perturbed ODEs with periodic coefficients; asymptotic solutions to the problem of vortex structure around a cylinder; investigation of the regular and chaotic dynamics; rare phenomena and chaos in power converters; non-holonomic constraints in wheeled robots; exotic bifurcations in non-smooth systems; micro-chaos; energy exchange of coupled oscillators; HIV dynamics; homogenous transformations with applications to off-shore slender structures; novel approaches to a qualitative study of a dissipative system; chaos of postural sway in humans; oscillators with fractional derivatives; controlling chaos via bifurcation diagrams; theories relating to optical choppers with rotating wheels; dynamics in expert systems; shooting methods for non-standard boundary value problems; automatic sleep scoring governed by delay differential equations; isochronous oscillations; the aerodynamics pendulum and its limit cycles; constrained N-body problems; nano-fractal oscillators and dynamically-coupled dry friction. Illustrations note 124 Illustrations, color; 136 Illustrations, black and white; XIV, 538 p. 260 illus., 124 illus. in color. 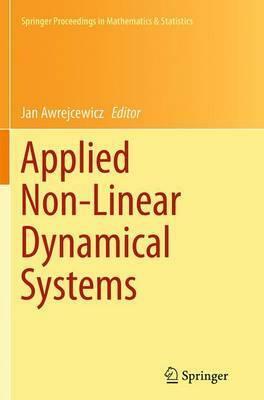 The book is a collection of contributions devoted to analytical, numerical and experimental techniques of dynamical systems, presented at the International Conference on Dynamical Systems: Theory and Applications, held in Lódź, Poland on December 2-5, 2013. The studies give deep insight into both the theory and applications of non-linear dynamical systems, emphasizing directions for future research. Topics covered include: constrained motion of mechanical systems and tracking control; diversities in the inverse dynamics; singularly perturbed ODEs with periodic coefficients; asymptotic solutions to the problem of vortex structure around a cylinder; investigation of the regular and chaotic dynamics; rare phenomena and chaos in power converters; non-holonomic constraints in wheeled robots; exotic bifurcations in non-smooth systems; micro-chaos; energy exchange of coupled oscillators; HIV dynamics; homogenous transformations with applications to off-shore slender structures; novel approaches to a qualitative study of a dissipative system; chaos of postural sway in humans; oscillators with fractional derivatives; controlling chaos via bifurcation diagrams; theories relating to optical choppers with rotating wheels; dynamics in expert systems; shooting methods for non-standard boundary value problems; automatic sleep scoring governed by delay differential equations; isochronous oscillations; the aerodynamics pendulum and its limit cycles; constrained N-body problems; nano-fractal oscillators; and dynamically-coupled dry friction. Duffing-Type Oscillators with Amplitude-Independent Period.- Asymptotics of Rigid-Body Motions for Nonlinear Dynamics: Physical In-sight and Methodologies.- Non-Linear Phenomena Exhibited by Flexible Cylindrical and Sector Shells.- Gear Shift Patterns in Uncertain Terrestrial Locomotion Systems.- Turbulence in Flexible Plates and Shells.- Using Bifurcation Diagrams for Controlling Chaos.- Shear Waves Dispersion in Cylindrically Structured Cancellous Viscoelastic Bones.- Quasi-Regular and Chaotic Dynamics of Postural Sway in Human.- Modeling of Ropes with Consideration of Large Deformations and Friction by Means of the Rigid Finite Element Method.- Dynamical Response of a Van Der Pol-Duffing System with an External Harmonic Excitation and Fractional Derivative.- Vortex Structure Around the Cylinder at a Flow of Viscous Fluid.- Asymptotic Analysis and Limiting Phase Trajectories in The Dynamics of Spring Pendulum.- Vibration Surveillance System with Variable Stiffness Holder for Flexible Details Milling.- Diversities in the Inverse Dynamics Problem for Underactuated Mechanical Systems Subject to Servo-Constraints.- Rare Phenomena and Chaos in Switching Power Converters.- Constrained Motion of Mechanical Systems and Tracking Control of Nonlinear Systems.- The General Conception of Intellectual Investigation the Regular and Chaotic Behavior of Dynamical Systems of Special Structure.- Dynamic Properties of Two-Axle Freight Wagon with UIC Double-Link Suspension as a Non-Smooth System with Dry Friction.- Dynamics of Mechanical Systems with Mecanum Wheels.- Reliability Analysis of the Dynamics of a Horizontal Drill-String.- Transition in Oscillatory Behavior in Mouse Oocyte and Mouse Embryo Trough Oscillatory Spherical Net Model of Mouse Zona Pellucida.- Constrained N-Body Problems.- Hunting French Ducks in Population Dynamics.- Model of Nonlinear Fractal Oscillator in Nanosystem.- Dynamical Statement Networks.- The Shooting Method for Non-Standard Boundary Value Problem.- Automatic Sleep Scoring From a Single Electrode Using Delay Differential Equations.- Methods for the Quick Analysis of Micro-Chaos.- Bouncing Ball Dynamics: Simple Motion of the Table Approximating the Sinusoidal Motion.- Periodic Motions of Coupled Oscillators Excited by Dry Friction and Harmonic Force.- Limit Cycle Oscillations of an Aerodynamic Pendulum.- Vibratory Energy Localization by Non-Smooth Energy Sink with Time-Varying Mass.- Coordinate-Free Formulation of Nonholonomic Constraints for Wheeled Robots.- Optomechatronic Choppers with Rotating Elements: Design Programs.- A Delay Mathematical Model for HIV Dynamics in HIV-Specific.- The Application of Parametric Excitation in Resonant MEMS Gyros.- Influence of Smart Materials on the Dynamical Response of Mechanical Oscillator.- Dynamical Pendulum-Like Nonconservative Systems.